Quick, easy and healthy! 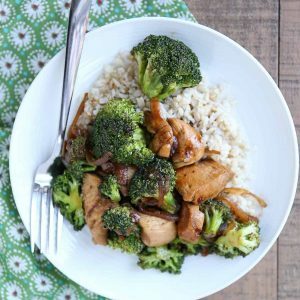 This Asian Chicken and Broccoli Stir Fry from The Weekday Lunches & Breakfasts Cookbook is a great addition to your weekday lunch or dinner rotation. Heat large stainless steel skillet over medium-high heat. Add 1/2 tablespoon of oil, and let it warm for a few seconds. Add the onion strips and let them cook for 2 minutes. Add the garlic and stir. Push the garlic and onion to the outside of the pan. Pour the remaining oil in the center of the skillet. Add the chicken. Spread across the skillet and sprinkle with cornstarch. Cook without stirring for 2 minutes, until browned, and then use a sturdy metal spatula to lift and flip each piece of chicken. Cook for 1 minute. While the chicken is cooking, stir together the soy sauce, honey and chili paste. Add the sauce to the skillet and stir to combine. Add the broccoli on top of the other ingredients and cover with lid. Cook for 2 minutes. The broccoli should be bright green and barely softened. Remove the lid and stir, scraping up any bits of sauce or meat from the bottom of the skillet. Simmer 1 minute to thicken the sauce, stirring frequently. Serve on its own or over rice, if desired. Great for meal prep: Store this in an airtight container for up to 3 days. Reheat in the microwave or on the stove. This can be stored in one large container or portioned into individual servings for storage and reheating. Note: Boneless skinless chicken breasts can be used in place of thighs in this recipe (I used chicken breast because it’s what I had in freezer). However, breasts will cook faster, so take care not to overcook.